The men's gymnastics team will be reinstated Monday due to its acquisition of $2.5 million of donations. In 1912, the Cal men's gymnastics team held its inaugural season. And after nearly a year of uncertainty, the squad will be able to celebrate its centennial. One of five varsity athletic teams originally cut on Sept. 28, men's gymnastics was the final sport to be reinstated by the campus on Monday. The program garnered about $2.5 million in donations that, despite not meeting the campus's fundraising goal of $4 million, should sustain men's gymnastics in the immediate future. Freshman Donothan Bailey was the first to learn of the reinstatement after a coach let it slip in a candid conversation. Bailey said the members of the team had mixed emotions of relief and excitement when they finally learned they were going to be able to compete again next winter. "They got us around in a little circle and told us," he said. "(There was) obviously excitement. We were all pretty happy. It's tough to get something like this taken away from you. We were all ecstatic, it was a pretty awesome feeling." The reinstatement agreement comes on the heels of a lengthy fundraising campaign that began early last August. According to senior and team captain Daniel Geri, the campaign to keep the team alive - Cal Gymnastics Forever - collected over 1,000 pledges on its website. The outreach to gain donations included calls to alumni and a partnership outreach program with USA Gymnastics, which helped gather pledges at other gymnasiums around the country. "It was all a collective effort from the entire gymnastic community, so it was really awesome to see the gymnastics community act as a family and raise all that money," Geri said. Coach Tim McNeill, a UC Berkeley alumnus who began coaching this year after serving as a graduate intern for the team in 2009, said that while there were many challenging points throughout the season, he could not have been happier with how the season went. "I think it would have been really easy to give up at any point, but no one did the entire year," McNeill said. "It's incredible that the team stuck together in a really tough situation." The amount of money collected will be enough to sustain the program for the next seven to 10 years, but the team will be restricted in its ability to offer financial aid until the $4 million mark is reached, according to Athletic Director Sandy Barbour. The program will have three total scholarships to divide among its returning gymnasts next season - less than half of the NCAA maximum of 6.3 scholarships allowed for men's gymnastics. However, barring additional funds, incoming gymnasts will not be able to receive a scholarship should they choose to compete for the team. This year, the team divided 4.7 scholarships among nine gymnasts, with the team's graduating seniors accounting for 1.7 scholarships. ''This is a concession to the timing and to the fact that they have not and are not yet at the $4 million mark," Barbour said. "There is a step down in financial aid, and as to any other curtailment? We have not contemplated that at this point." The team will continue fundraising as it enters its 100th season next winter while also resuming recruitment efforts after missing out this year due to the program's uncertain future. Currently, all 14 members eligible to return plan to do so. McNeill, who will be at this week's Junior Olympic National Championships to recruit, said he hopes to stay put at UC Berkeley as well. After guiding the team to a fourth-place NCAA finish in a turbulent first year at the helm, McNeill will be discussing long-term plans with Barbour in the coming weeks. "(McNeill's) leadership skills, they're the best of anybody I know," Geri, who was a former teammate of McNeill's, said. 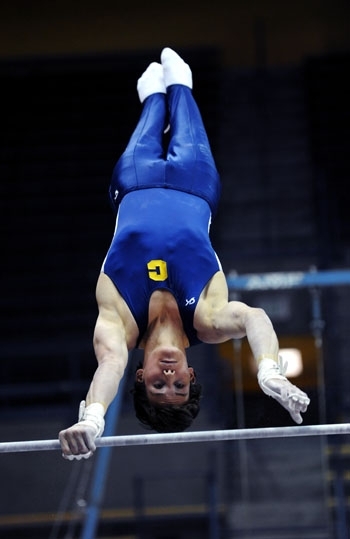 "He's told us multiple times that this is his dream job, to be a gymnastics coach at a university. This is what he wants to do." Bailey said that while the team understands its disadvantage after missing out on the prime recruitment period, the team is confident about its chances next season. The team will be led by a trio of talented All-Arounders in Bailey, junior Glen Ishino and Swiss national team member and sophomore Dennis Mannhart. "With all of the distractions that have been going on this year, with us getting cut, it was just a big roller coaster ride that Sandy (Barbour) and the chancellor were giving us," Geri said. "We had to deal with that all the time in the gym, and considering the circumstances I think we did awesome ... We still have a very good chance of being a really good competitor at NCAAs."